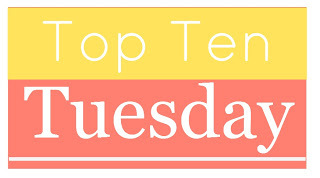 This week’s TTT is Top Ten Most Intimidating Books (might be intimated by size, content, that everyone else loves it but you are sure you won’t etc). I broke my list down into books that I haven’t read because of the hype (and I’m scared of my reaction), books that are long and books that I am afraid I am not going to like (and I want to like). The first three books all have a lot of hype surrounding them so I am afraid once I pick them up I will force myself to like them even if I don’t. Maybe when the hype dies down a bit. The middle three intimate me because they are a bit lengthy and I know it will take me some time to read them and I am just in a light, quick read mood so I won’t be picking these up any time soon. And the last three books are all books I want to love. I want to love Silver Linings Playbook because I loved the movie and I fear I wont enjoy the book as much. I want to love Casual Vacancy because its JK Rowling but it’s so British. Lastly I want to love Taken because Erin Bowman is such a great person and I have heard some not OK reviews about this book. I just want to love all the books! And Game of Thrones has it’s own section for many reasons. I have probably been reading this book for close to three months and I am only about half way through. The length, the hype and the fact that I want to love this book makes it intimating to me! Ah we have two books on our lists that are the same this week! Game of Thrones and Les Miserables. I really want to read The Knife of Never Letting Go.. but it is a bit of an intimidating one! I know a good many people who didn’t like Code Name Verity. I loved it, so it was hard seeing others not like it. However, The Book Thief… wow. I know it seems like one of those that meh, sure everyone loved but I probably won’t.. but yeah, SO GOOD! If you like audiobooks, I would HIGHLY suggest listening to that! The Knife of Never Letting Go (and the series) is wonderful… but again one of those it could go either way. I think it just depends on what you want out of it, you know? I haven’t read the others, but they kind of intimidate me too! Les Mis is seriously on almost everyone’s list! I freaking HATED the damn Book Thief when it was required reading in my YA Lit class recently. This was a huge shock and disappointment, as I read and write almost exclusively historical, and the WWII/Shoah era is one of my areas of expertise. Just thinking about that smug, gimmicky, spoilerific narrator makes me angry, so many months later. It was such a relief to go on Good Reads and Amazon and discover many other people who hated it as much as I did.